TALLAHASSEE — Gov. Rick Scott and the Florida Cabinet on Wednesday imposed a minimum five-year waiting period for felons to apply to have their rights restored, setting up a tougher standard than the state has used for years. Florida now joins Kentucky and Virginia as the only states that require felons who have completed the terms of their sentences to apply to have their rights restored. Critics say the new process is a return to post-Civil War Jim Crow laws crafted to prevent blacks from voting. "The Board today didn't just go back to before the Gov. Crist reforms; they went way, way past that — placing brand new, long-term restrictions on getting basic rights restored," said Howard Simon, executive director of the ACLU of Florida. "The new administration that runs Tallahassee today demonstrated their hostility to the fundamental right of any democracy, the right to vote." Scott and the Cabinet, acting as the board of executive clemency, approved the new rules unanimously after hearing 30 minutes of public comments limited to two minutes per speaker. The rules were not available for review until minutes before the board's meeting began late Wednesday morning. Under the new rules, felons convicted of non-violent crimes can apply to have their rights restored without a hearing five years after they have completed their sentences and paid restitution, while felons convicted of violent crimes must wait seven years to apply and then win approval in a hearing. Florida had a five-year waiting period for all felons from 1975 to 2004, when then-Gov. Jeb Bush eliminated the waiting period for non-violent felons but required them to apply for the restoration of rights. In 2007, Gov. Charlie Crist and that Cabinet put in place the automatic restitution of rights for non-violent felons who had completed their sentences. 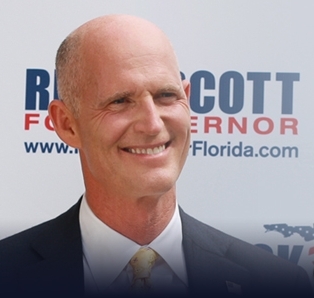 "Felons seeking restoration of civil rights demonstrate they desire and deserve clemency only after they show they're willing to abide by the law," Scott said before the vote by the all-Republican panel made up of Attorney General Pam Bondi, Chief Financial Officer Jeff Atwater and Agriculture Commissioner Adam Putnam. All four were elected in November. Bondi, a former prosecutor, had floated the idea of the rules changes at the new board's first clemency meeting two weeks ago. But on Wednesday, it was Scott who was calling the shots. Felons convicted of non-violent crimes can apply to have their rights restored five years after they have completed their sentences and paid restitution. •Felons convicted of violent crimes, including murder and DUI manslaughter, must wait seven years, request a hearing and win approval in the hearing to have their rights restored. • All felons must wait eight years after release before they can apply for the right to carry a firearm. The previous rule allowed them to seek a waiver to apply earlier. Sounds like they are afraid of the power of the black vote. Unfortunately, a great number of african-american men have a felony record. This includes some rap artists. And there are some who don't have the proper information on their rights. Some thought they lost their right to vote forever as a felon. The 2012 election is coming up fast and they are gonna do what they can to make sure that Obama doesn't get re-elected.